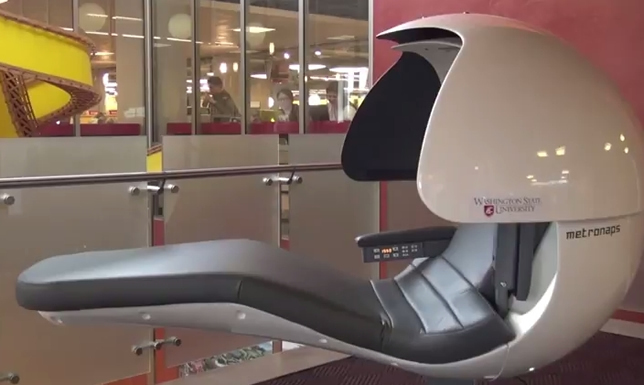 Washington State University has begun testing out a "napping pod" as part of a transformation of its student recreation hub. In January 2017 the university's new Chinook Student Center will open, featuring a hot yoga studio, an espresso bar and possibly as many as 10 or 15 pods, self-contained units that give students privacy while they take timed power naps to ambient music. When their time is up, the pod vibrates them awake. Washington State University's Chinook Student Center will feature as many as 10 or 15 pods, self-contained units that give students privacy while they take timed power naps to ambient music. When their time is up, the pod vibrates them awake. The institution joins a number of other schools that have added the "energypods," as they're called by MetroNaps, the company that designs and sells the units. In February, the University of Miami student government invested in two of the pods at $9,000 to $10,000 apiece. Other schools that have added them include: California State University, Northridge; U California, Berkeley; and Wesleyan U, which added its first napping pod in 2012. The pods address an age-old problem for college students: the lack of sleep. According to a 2015 study on student health, only 9 percent of respondents said sleepiness wasn't a problem during their daytime activities. The units aren't the only solution being tested by institutions to help students get re-energized during their day. Berkeley also offers "Relaxation Enhancing Study and Tranquility" or REST zones with lounge chairs and massage chairs in four areas on campus. And James Madison University allows students to reserve beanbags in its "nap nook" for 40-minute breaks. Then, of course, there's the usual campus sofa, no timer required.